Oh Target and Hobby Lobby - how I love you so!!!!! Actually below are pictures of a shopping spree at those fabulous stores and also Dollar Tree and Staples. So here is what I am planning for some of the things I bought. 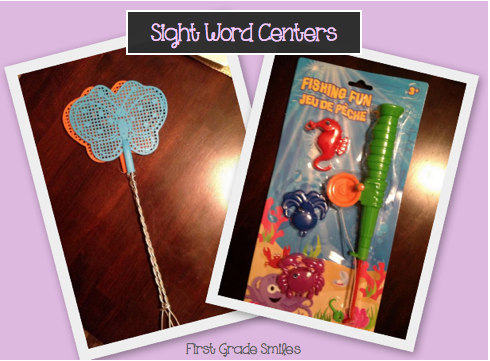 I plan to use the Fly Swatters to swat and read sight words (probably at a group with me or another adult so it doesn't get out of hand). Or maybe as a whole class activity to swat the words that rhyme or have a short a sound or something like that. I think I'll have to make a fun Fishing for Sight Words center with this cute fishing pole from the Dollar Tree. Maybe I'll turn a dish bin into a small pond (minus the water). They could fish for sight words and then use the ones they get in a sentence. Math, huh? Well the heart is perfect for working on combinations to 10. I think I'll save it for Valentine's Day and use conversation hearts. And the plain white plastic tablecloths???? Ok - this is a project. I plan to make a life size tens frame on one of them and a life size number line on the other. I haven't decided how to do it yet - I'm thinking some fun duct tape to start. Not sure about the rest yet. Any suggestions??? 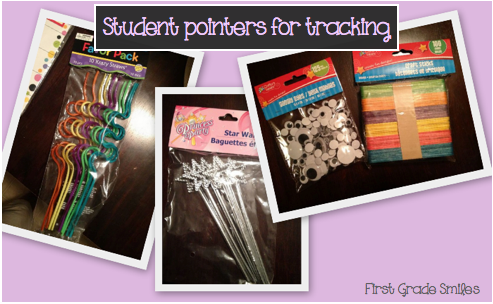 Here are some Dollar Tree finds for kids to use when tracking as they read. I will be gluing the googly eyes on the popsicle sticks so everyone has their own, but then the others will be special ones for centers or guided reading. 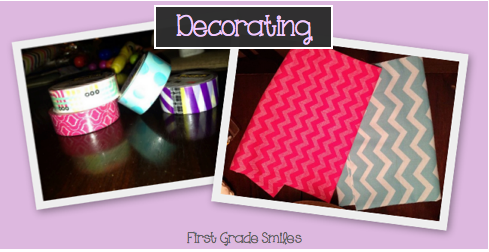 Washi tape and chevron - Yes, please!!!! I have lots of little things planned for the washi tape - nothing big yet. I'm going to use one of the chevron fabrics to cover a small cork board that I have next to my desk. Not sure about the other one yet. 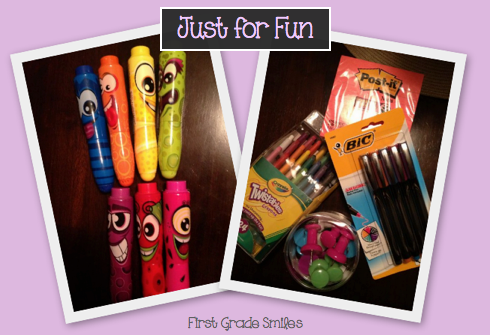 I'm new to Scentos, but I'm sure my kiddos will LOVE them!!! And do you see those adorably oversized push pins. Fun!!! This is what my classroom looks like right now. Nothing was put back where it was and I was missing a few pieces of furniture that I had to hunt down around the school. Ugh!!! So much to do!!! Here are just a couple of the things I've been working on at home (when I'm not stressing about my classroom or shopping). A new lunch clip chart and some math resources. 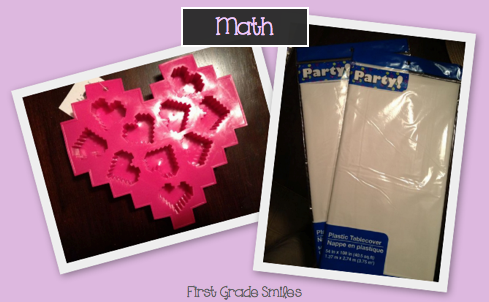 You can find the math resources in my TpT store. Let me know if you're interested in the lunch chart and I will make it a freebie. I wasn't sure though since each school has their own choices for lunch and ways of saying it. And finally, some things to hopefully make you laugh. If you follow me on Instagram you have seen these already. I'm potty training my youngest right now. It is my least favorite thing about parenting. She's doing great, but there's always a few slip-ups along the way, so this is my new best friend. And I just loved this e-card (despite the typo). Hilarious!!! (I took this picture of my computer screen so it got all wacky - sorry). 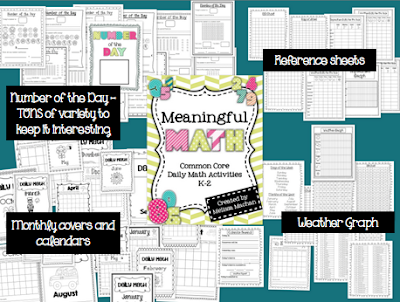 Oh, and have you seen this free resource that was just added to TpT??? 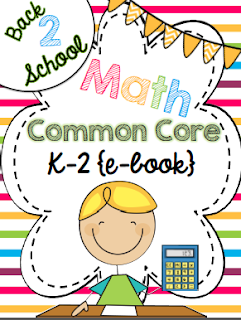 This one is for Math K-2 Common Core resources put together by the amazing Rachelle Smith at What the Teacher Wants. There is going to be an ELA K-2 that Deanna Jump is putting together too. There are also ones for 3-5 and tons more. Click on the picture to go to TpT to download it for free. 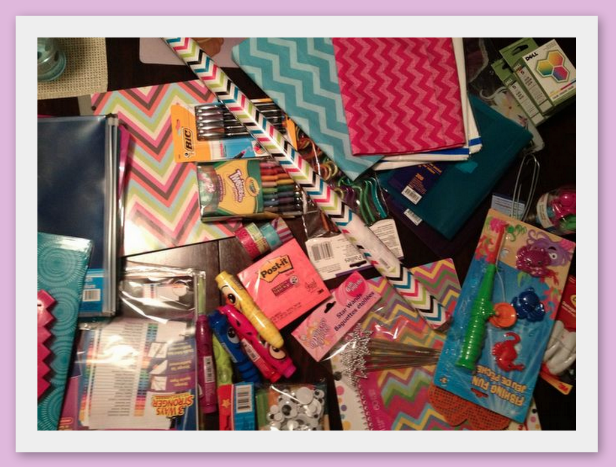 You will find TONS of great tips for implementing common core standards and freebies!!! I hope you are enjoying your summer, even if you're getting ready for going back to school. I would LOVE to have your lunch chart. It will go nicely with my behavior chart! I uploaded the Lunch Chart file as a freebie on my Facebook page. You can go there to get it: https://www.facebook.com/FirstGradeSmiles OR you can leave me your email address here and I will send it to you :) I hope it works for you! I would love the lunch count chart too! Love it!